The merger between Npower and SSE’s retail business cleared a major hurdle with provisional approval from the CMA. Soon, the big six could become the big five. The transformation of the big six into the “big five” in the UK’s energy retail market moved a step closer when SSE and Npower cleared a major hurdle last week. After an in-depth review, the Competition and Markets Authority (CMA) on 30 August provisionally found that the proposed merger between SSE Retail (SSE) and Innogy’s Npower “does not raise competition concerns”. If the deal, expected to be worth around £7 billion, gets full approval in October it will bring together the third (SSE) and sixth (Npower) largest players in UK domestic energy supply. On completion, the two will cease to exist as separate entities and a new retail company, yet to be named, will be listed on the London Stock Exchange. The transaction is expected to complete in the last quarter of 2018 or the first quarter of 2019. The standalone retail business would have its own dedicated board of directors and specialist management team. Enter Katie Bickerstaffe. There may be no name in place for what the CMA is referring to as “MergeCo” for the time being, but the company’s chief executive was revealed back in April and Bickerstaffe is expected to take up her appointment on the 24th of this month. She has previously served as a non-executive director of SSE for seven years and was chief executive elect of the UK and Ireland division of multinational electrical and telecommunications retailer Dixons Carphone until April 2018 – a role she held since 2015. Bickerstaffe is no stranger to the coming together of two industry heavyweights, having helped oversee the £4 billion merger of Dixons with Carphone Warehouse when she was chief executive of the former. The proposed new energy company has also not wasted any time in appointing a chief financial officer. Gordon Boyd, who has held senior finance leadership positions at utilities including British Energy and EDF Energy. He is no doubt already helping shape the future direction of the new retailer, having joined on 4 July. Both SSE and Npower have welcomed the CMA’s approval, after the competition watchdog previously raised concerns about the most common and expensive energy tariffs, standard variable tariffs (SVTs). The CMA’s phase two investigation, which commenced on 8 May 2018, has since found the two energy giants do not compete closely on SVT prices. It considers that the reduction in the number of large energy firms from six to five will “not significantly change” how the companies benchmark their price levels. “They are not likely to announce a change out of line with the range of price changes by other large suppliers,” it adds. In the space of four years the big six have seen their combined market share decline from around 95 per cent in 2013 to just under 80 per cent in 2017. It coincides with the “significant entry and expansion by new suppliers”. As of March 2018, there were 72 energy retailers supplying domestic customers in Great Britain, consisting of six large energy firms and 66 small and mid-tier suppliers, mainly active in the supply of both gas and electricity, the CMA reveals. This compares with around 40 suppliers in 2015. Anne Lambert, chair of the CMA’s inquiry group, which has been investigating how the merger might affect households, says: “It is vital householders have a range of energy suppliers to choose from so they can find the best deal. With more than 70 energy companies out there, we have found there is plenty of choice when people shop around. “But many people don’t shop around for their energy. So we carefully scrutinised this deal, in particular how it would impact people who pay the more expensive standard variable prices. “Our analysis shows that the merger will not impact how SSE and Npower set their SVT prices because they are not close rivals for these customers. The regulator’s default tariff cap, which received Royal Assent and entered into law on 19 July 2018, is expected to be in place by the end of the year. As part of its assessment, the CMA examined evidence from the six large energy suppliers, smaller suppliers, customer groups and regulators. This included hearings with consumer groups and suppliers in Scotland, where SSE has a large share of consumers. None of these raised substantive concerns about the effects of the merger on householders, the CMA highlights. Meanwhile, Citizens Advice is urging SSE and Npower to manage the merger in a way that works well for their customers. Martin Herrmann, chief operating officer retail of Innogy SE, Npower’s parent company, stresses that the new organisation will “combine the best from both companies to meet evolving customer expectations and address advancing market challenges”. He describes the provisional clearance from the CMA as “another important milestone” and says the plans are “clearly on schedule”. Alistair Phillips-Davies, chief executive of SSE, adds that the merger presents a great opportunity to create a more “agile, innovative and efficient company” that delivers for customers and the whole energy market. He says: “Following a thorough and in-depth investigation, we are pleased the CMA has provisionally concluded that the proposed merger of SSE Energy Services and Npower does not raise competition concerns. “We look forward to continuing to engage with the CMA as it prepares its final report ahead of the statutory deadline in October. We remain confident that the formation and listing of the new company is on track for completion by the end of SSE’s financial year,” he says.The merger will create the second-largest energy supplier in the British market – with a share of around 24 per cent. Greg Jackson, chief executive of independent supplier and challenger Octopus Energy, says: “Consolidation alongside legacy companies is a natural transition – we’ve seen it in airlines, and now we’re seeing it in energy. The best of the challengers will keep growing, bringing lower prices and better service to millions of customers. The CMA is now seeking views and evidence on its provisional decision by 20 September 2018 before coming to a final view. The statutory deadline for the CMA’s final report is 22 October 2018. With it looking increasing likely the companies will get full clearance, the finishing post is surely now coming into view. • If SVT customers switch, they usually change to a cheaper, non-SVT, tariff. • The risk of losing customers as a result of an SVT price rise will not change with the merger. • Evidence that few customers switch between SSE and Npower, instead preferring to move to other suppliers. • SSE and Npower do not compete closely on SVT prices. 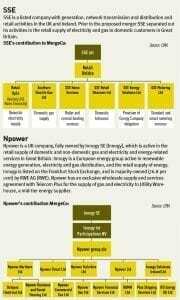 On 8 November 2017, Innogy and SSE entered into an agreement to transfer Npower and SSE Retail into a new company. The combined retail company will be listed on the premium segment of the London Stock Exchange and will not be controlled by either Innogy or SSE. Innogy will receive a 34.4 per cent equity stake in MergeCo, which it will be required to hold for at least six months, and SSE’S stake of 65.6 per cent will be distributed to its shareholders immediately following the transaction. SSE shareholders backed the proposed merger on 19 July, following the publication of a circular in which the company’s chairman Richard Gillingwater urged them to vote through the deal.